The movie is about an Iranian woman, who is divorced and recently remarried, and drives a cab in Tehran. The ten conversations she has in the cab make up the movie. We see the people's' faces, often in shadows from the camera that is fixed to the dashboard. Much of the movie is about the struggle that women in Iran have to be happy. The woman's young son calls her a "stupid cow", perhaps echoing the language he has heard from his father. The woman picks up a prostitute who was treated badly by her lover, a friend whose husband is abusive and a young woman who goes to a religious place to pray because she wants to get married. The women explains her divorce to her angry son saying "I feel fulfilled now like a flowing river. I was a stagnant pond. My brain was devastated." The movie makes a very powerful statement for women's rights in a society that is dominated by men. Roger stunned me in his review when he said "Anyone could make a movie like Ten. Two digital cameras, a car and your actors, and off you go. Of course much would depend on the actors, what they said, and who they were playing (the little actor playing Amin is awesomely self-confident and articulate on the screen, and effortlessly obnoxious). But if this approach were used for a film shot in Europe or America, would it be accepted as an entry at Cannes? I argue that it would not. Part of Kiarostami's appeal is that he is Iranian, a country whose films it is somewhat daring to praise. Partly, too, he has a lot of critics invested in his cause, and they do the heavy lifting. The fatal flaw in his approach is that no ordinary moviegoer, whether Iranian or American, can be expected to relate to his films. They exist for film festivals, film critics and film classes." I completely disagree with Roger on this one. I loved this movie. On IMDB it has a rating of 7.2 and on Rotten Tomatoes the critics rate it at 86%. 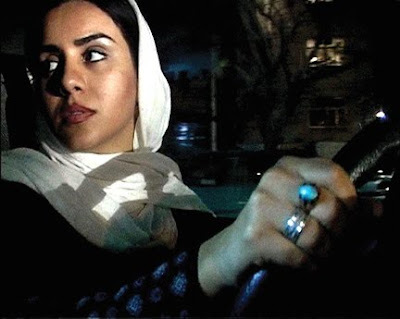 The consensus at Rotten Tomatoes said "Ten turns a conversational car ride into a gritty and compelling character study full of real emotion while providing an intriguing look into the lives of women in contemporary Iranian culture." This movie is reminiscent, to me, of the style of American Ramin Bahrani, whose films place more emphasis on portraying reality than on narrative. The neo-realist documentary style is refreshing, especially after being dragged along by so many movies that are driven by a narrative that is forced and contrived. I don't know what Roger has against Abbas Kiarostami, whose movies A Taste of Cherry and The Wind Will Carry Us, he also doesn't seem to like. Roger loves Ramin Bahrani, and has actually championed his films, but he has no love for the great Abbas Kiarostami.